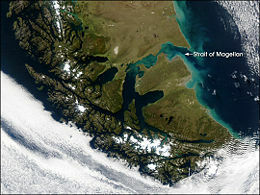 A true-color image of Tierra del Fuego captured by NASA's Terra satellite on March 28, 2003. Tierra del Fuego (Spanish for "Land of Fire"), is an archipelago at the extreme southern tip of South America, separated from the mainland by the Strait of Magellan. The southern point of the archipelago forms Cape Horn. Its main island, Isla Grande de Tierra del Fuego, is shaped like a triangle with its base on Beagle Channel. The total area is 73,746 km² (28,473 sq mi) about two-thirds of which belongs to Chile and the remaining one-third to Argentina. Agreed upon in 1881, the boundary follows the meridian 68°36′38″ W, from Cabo Espíritu Santo on the Atlantic Ocean, and the east–west Beagle Channel. Several islands at the mouth of the channel are disputed between the two countries. Petroleum was discovered at Manantiales in 1945, converting the northern part of Tierra del Fuego into Chile’s only oil field. Tierra del Fuego has become renowned as one of the few surviving regions of the world where pristine nature still exists. It is known and treasured for its breathtaking mountain vistas and simple, back-to-nature lifestyle. Map of Tierra del Fuego, showing national boundaries. In 1520, Ferdinand Magellan, a Portuguese sailor in service to the Spanish King, became the first European to navigate the strait—later named for him—during his global circumnavigation voyage. It was during this journey that he discovered and named Tierra del Fuego (meaning "Land of Fire"). Originally, he called it the "Land of Smoke," but it was later changed to Land of Fire. The fires he saw were those of the indigenous Yamana people who lived in the southern part of the island, in order to ward off the low temperatures in the area. While various navigators traversed the area, no systematic exploration was attempted until the British Admiralty undertook a thorough survey of the entire archipelago. The Strait of Magellan was first carefully explored and thoroughly charted by Phillip Parker King, who commanded the British survey vessel HMS Adventure, and in company with HMS Beagle, spent five years surveying the complex coasts around the Strait. The result was presented at a meeting of the Royal Geographical Society in 1831. Surveys of the archipelago itself lasted from 1826 to 1836. In 1830, Captain Robert FitzRoy, on his first voyage with the Beagle, took a group of hostages from the Fuegian indigenous people after one of his boats was stolen. He decided to take four of the young hostages with him to England "to become useful as interpreters, and be the means of establishing a friendly disposition towards Englishmen on the part of their countrymen." It is reported that he showed great concern for the four, feeding them before his own officers and crew and intending them to be educated and Christianized so that they could improve the conditions of their kin. 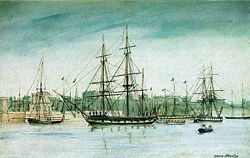 The Beagle arrived in Plymouth in mid-October 1830. The newspapers soon began publishing details of the exotic visitors and they became celebrities. In London, they met King William IV and Queen Adelaide. One year later, the Beagle returned the three surviving Fuegians home, still captained by FitzRoy and at great expense to himself. He took with him a young naturalist, Charles Darwin, in what was the second voyage of HMS ''Beagle''. For 350 years after Magellan’s voyage, the region remained in the control of its indigenous peoples, the Ona, Yahgan, and Alacaluf Indians. Colonization by Chilean and Argentine nationals in 1880 was the beginning of sheep farming in the archipelago as well as the discovery of gold. Both countries claimed it in its entirety. In 1881, it was divided between these two countries. The discovery of petroleum at Manantiales in 1945 converted the northern part of Tierra del Fuego into Chile’s only oil field. The archipelago consists of a main island (Isla Grande de Tierra del Fuego, often simply called Tierra del Fuego or Isla Grande) with an area of 48,100 km² (18,572 sq mi), and a group of smaller islands. Half of this island, and the islands west and south of it, are part of the Magallanes y Antártica Chilena Region, the capital and chief town of which is Punta Arenas, situated on the mainland across the strait. The largest Chilean towns are Porvenir, capital of the Chilean Province of Tierra del Fuego, on the main island, and Puerto Williams, on Navarino Island, being the capital of the Antártica Chilena Province. Puerto Toro lies a few kilometers south of Puerto Williams and is the southernmost village in the world. The eastern part of the archipelago belongs to Argentina, being part of the Tierra del Fuego, Antarctic Territory and South Atlantic Islands Province; its capital is Ushuaia, the largest city of the archipelago, and the other important city in the region is Río Grande, on the Atlantic coast. The Cordillera Darwin is a short mountain range mantled by an ice field. 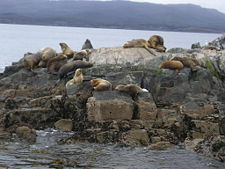 It is located in the southwestern portion of Isla Grande de Tierra del Fuego, entirely within the Chilean territory. 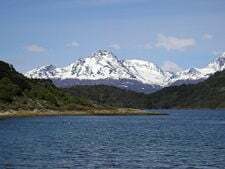 It is part of the longest Andes range and includes the highest mountains in Tierra del Fuego, with elevations reaching over 2,000 m. Darwin Range extends in a west-east direction from the Monte Sarmiento in the vicinity of Magdalena Channel to Yendegaia valley. It is bounded by the Almirantazgo Fjord on the north and the Beagle Channel on the south. The range is named after Charles Darwin and is the most important feature of Alberto de Agostini National Park. The climate in this region is inhospitable. It is a subpolar oceanic climate (Köppen climate classification Cfc) with short, cool summers and long, wet, moderate winters: the northeast is characterized by strong winds and little precipitation, in the south and west it is very windy, foggy, and wet for most of the year and there are very few days without rain, slush, hail or snow. The permanent snow-line begins at 700 m (2,300 ft) above sea level. Isla de los Estados, 230 km (143 mi) east of Ushuaia, receives 1,400 mm (55 in) of rain. Rainfall is heavier in the west, 3,000 mm (118 in) a year. Temperatures are steady throughout the year: in Ushuaia they hardly surpass 9 °C (50 °F) in summers and average 0 °C (30 °F) in winters. Snowfall can occur in summer. The cold and wet summers help preserve the ancient glaciers. The southernmost islands possess sub-antarctic climate typical of tundra that makes the growth of trees impossible. Some areas in the interior have a polar climate. Regions in the world with similar climates to southern Tierra del Fuego are the Aleutian Islands, Iceland, the Alaska Peninsula, and Faroe Islands. Only 30 percent of the islands have forests which are classified as Magellanic subpolar; the northeast is made up of steppe and cool semidesert. Vegetation is limited to mosses and stunted trees in the exposed southern and western areas. 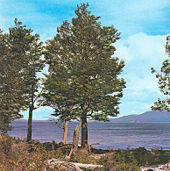 The central region of the main island has deciduous beech forests, while the northern plains have a tussock grass cover. 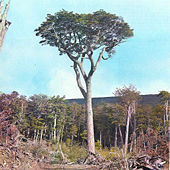 There are six species of trees found in Tierra del Fuego: Canelo or Winter's Bark (Drimys winteri), Maytenus magellanica, Pilgerodendron uviferum, the southernmost conifer in the world, and three kinds of Southern Beech; Nothofagus antarctica, Nothofagus pumilio, and the evergreen Nothofagus betuloides. These forests are unique in the world for having developed in a climate with such cold summers (around 9 °C (50 °F)). Tree cover extends very close to the southernmost tip of South America. Winds are so strong that trees in wind-exposed areas grow twisted by the force of winds. These have come to be called "flag-trees" for the shape they take in the fight with the wind. Tree vegetation extends as far south as the Isla de los Estados, Navarino Island and the north of Hoste Island. At altitudes above 500 m (1,640 ft), dwarf nothofagus communities are found. Further south, Wollaston Islands and the south of Hoste Island are covered by subantarctic tundra. Forests from Tierra del Fuego have expanded beyond local importance; their trees have been exported to locations with similar climate but which were devoid of trees, such as the Faroe Islands and nearby archipelagos. Most of the species were gathered from the coldest places in the archipelago, mainly with tundra borders. This effort resulted in positive changes, as the heavy winds and cool summers in the Faroe Islands did not previously allow the growth of trees from other regions in the world. The imported trees are used as ornamentation, as curtains against wind, and for fighting erosion caused by storms and grazing. Among the most notable animals in the archipelago are parakeets, seagulls, guanacos, foxes, kingfishers, condors, owls, and firecrown hummingbirds. 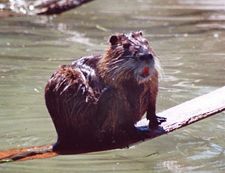 North American beaver, introduced in the 1940s, have proliferated and caused considerable damage to the island's forests. Marcela Uhart of the Wildlife Conservation Society explains "What happens when the beavers take over an area like this, they raise the water level, the roots in the trees rot, and the tree dies." The beavers, imported to raise on commercial fur farms were released when the project failed. Since they have no natural predators in Tierra del Fuego, there was a population explosion, with an estimated 100,000 today. Like mainland Chile and Argentina to the north, the archipelago boasts some of the finest trout fishing in the world. Sea Run Brown Trout often exceed 9 kg (20 lb), particularly in rivers such as the Rio Grande and San Pablo and in the Lago Fagnano. Much of this water is privately owned. The nutria (or coypu) is hunted for its fur. Petroleum was discovered at Manantiales in 1945, converting the northern part of Tierra del Fuego into Chile’s only oil field. Pipelines have been laid to the Strait of Magellan, and drilling platforms built there, for export of the oil to middle Chile. There is a small refinery in the archipelago to handle local needs. The main industries are oil and natural gas. There is sheep farming and ecotourism. On the Argentine side several electronic companies have been established. Tierra del Fuego is also home to the small brewing company Cervecería Fueguina, which produces three beers under the Beagle brand name. There is also some lumbering in the forested areas; fish and crayfish canning; and fur-hunting for nutria (or coypu) and seal. Roads are poor throughout the archipelago, and there are no railways. Air services link major settlements to Punta Arenas, Chile, and Río Gallegos, Argentina. 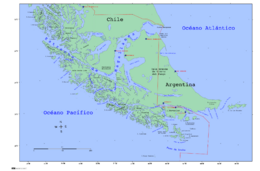 Sea connections are important; regular service links Porvenir and Punta Arenas, while naval vessels supply Ushuaia and the Isla Navarino, Chile. ↑ A. Højgaard, J. Jóhansen, and S. Ødum (eds. ), A Century of Tree Planting in the Faroe Islands (Føroya Frodskaparfelag, Torshavn). ↑ Gary Strieker, July 9, 1999, Argentina eager to rid island of beavers, Cable News Network. Retrieved December 20, 2008. Bollen, Patrick, Dree Peremans, and Cora Weir. 2000. Tierra del Fuego. Tielt: Lannoo. ISBN 9020940406. Bridges, E. Lucas. 1987. Uttermost Part of the Earth. The Century travellers. London: Century. ISBN 0712614931. Hazlewood, Nick. 2000. Savage: The Life and Times of Jemmy Button. London: Hodder & Stoughton. ISBN 9780340739112. Keynes, Richard, and Keith Thomson. 2002. "Book reviews—Fossils, Finches and Fuegians: Charles Darwin's Adventures and Discoveries on the Beagle, 1832-1836." Nature. 418 (6895): 277. OCLC 94883590. History of "Tierra del Fuego"
This page was last modified on 8 December 2015, at 22:26.